We’re sharing something a little bit out of the norm today - RECIPES! ‘Tis the season for holiday cooking and we can’t get it out of our minds! With Thanksgiving just around the corner, you are likely starting to prepare your meal plan + recipe list for the big day - and we want to help! 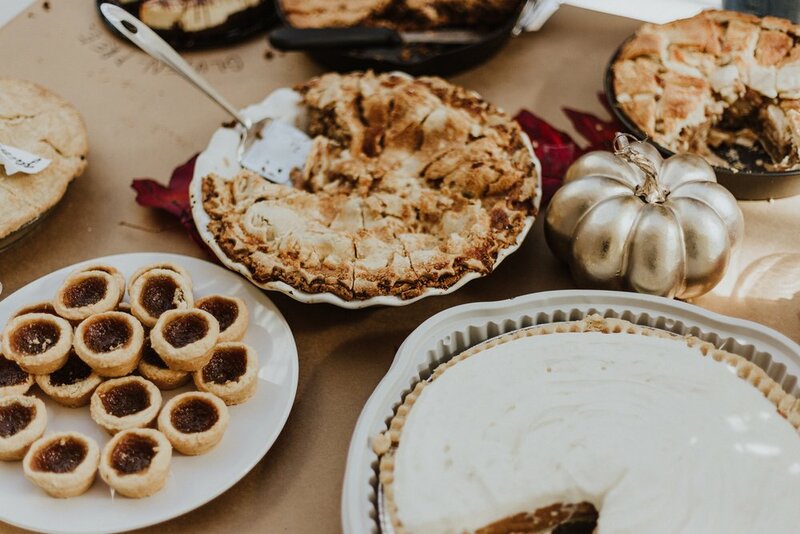 Below, Kellie from our team shares some of her favorite Thanksgiving recipes! We hope it helps make your preparations just a bit easier this year! Happy November! This is a turkey-cooking method that I have used for years - I’m never going back to an unbrined turkey! You can take this method and change out the flavor combinations as desired. I love to add sage to the butter and leave the turkey unstuffed! Brining a turkey takes a little more forethought than usual but it’s not hard and it’s so worth it! Instead of using a cooler for brining (as mentioned here) we just use a five-gallon bucket! Find the recipe here! This has been my go-to green bean casserole recipe for the last five years or so ever since my cousin’s wife brought it to Thanksgiving dinner. I had never in my life had a green bean casserole SO good! That’s because it’s made entirely from scratch. No cream of mushroom soup. No canned beans. Just fresh beans + homemade mushroom sauce + a special semi-homemade crunchy topping. If there is any day of the year to take your time making a from-scratch version of green bean casserole, Thanksgiving is the day! I usually make this the night before to make the day of easier! Find the recipe here! What would Thanksgiving be without a sweet potato casserole? This recipe is the most highly rated of its kind - 2,000 5-star reviews - can’t beat that! I definitely prefer a sweet potato casserole made from fresh sweet potatoes - not canned. This recipe uses fresh potatoes and has a crunchy pecan topping! My mouth is already watering! Find the recipe here! If you’ve never added roasted garlic to your mashed potatoes, you are missing out! My husband used this recipe as part of a beautiful dinner he made me for our fifth anniversary a few years ago. I couldn’t believe my tastebuds! You’ll think the amount of garlic is total overkill until you taste the potatoes - roasted garlic has a much more subtle and beautiful flavor than raw or sautéed garlic. These are some of the most dreamy potatoes I’ve ever eaten! And you can never go wrong with the Pioneer Woman! Find the recipe here! I grew up eating traditional parker house rolls often! They are still one of my favorite additions to a holiday meal! And what could be better than a Bobby Flay parker house roll recipe?! This version comes with hundreds of almost exclusive five-star reviews! Make them the day before to ease the stress! You’ll likely have all the ingredients on hand. Find the recipe here! You might be scratching your head at this one? Sour cream in an apple pie? All I have to say is don’t knock it until you try it! My mother is the QUEEN of pies - she makes five or six every Thanksgiving - traditional apple, sour cream apple, pumpkin, cherry, and lemon meringue (among others)! But sour cream apple has quickly become a favorite of mine. I actually make it throughout the year but it seems especially perfect for the fall baking season! It’s easy + delicious! Find the recipe here! If you’d like another alternative to the traditional apple pie, I’ve got one more option for you! This dreamy apple pie from The Pioneer Woman is sooooo good! I made it several years ago and still haven’t forgotten its impact. Dreamy is the right word for it! Find the recipe here! Written by Kellie Kaminski of the FCD team.